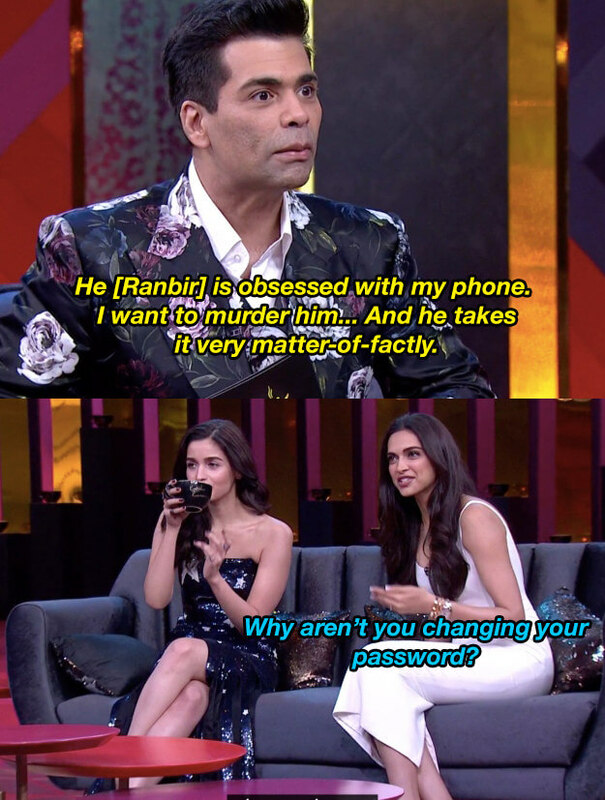 6 Hilarious Moments With DP and Alia On Koffee With Karan 6 - Bold Outline : India's leading Online Lifestyle, Fashion & Travel Magazine. As the most powerful young divas of Bollywood became the show-openers for Koffee With Karan season 6, we got to see a lot of goofiness, swag, drama, secrets spilling out, celebrity-equations and infectious laughter from our bona fide beauties Deepika Padukone and Alia Bhatt. From Alia pretending that she was never dumped to which Deepika reacts by calling her a liar to Alia expressing her envy for DP’s airport looks with her pap face and hot legs and Deepika admiring Alia’s candidness and readily wanting to tolerate her random burping, we got many moments we will cherish and laugh back at. Also, Karan totally wanted to do fifth-wheeling on a beach-holiday with Alia, Ranbir, Ranveer and Deepika how funny does that sound? So here we have picked up our personal favourite and hilarious highlighting moments from Johar’s show which is most anticipated by the audience than his Dharma Production’s films these days believes Karan. 2. Remember the famous hang-out party picture that did rounds on Instagram where Karan Johar, Shah Rukh Khan, Amir Khan, Alia Bhatt, Ranbir Kapoor, Deepika Padukone and Ranveer Singh are seen posing together? Well, seems like that was a random meet when Alia, Karan and Ranbir decided to call up everybody. 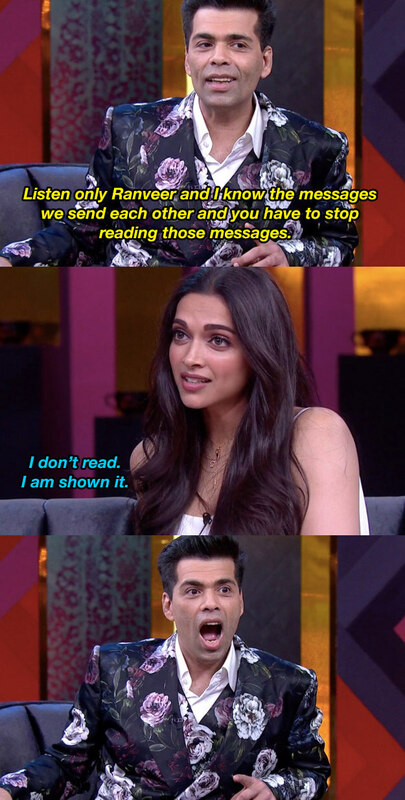 While Karan reminded the ladies about the awkward situation they all were in, given the dating history, Deepika said, ‘don’t try and make it awkward Karan, because it was not.’ Slayed it, totally. 3. When Karan was taken by surprise when Deepika threaten him that she would reveal all the sleazy and suggestive texts he sends her boyfriend, Ranveer Singh. Ahem, look who checks her beau’s messages and says, ‘I don’t read, I am shown it’. Also, what’s with Ranbir Kapoor being obsessed with Karan’s phone? Well, Karan won’t even change his password for that matter of fact so who cares anyway. 4. The picture of Alia Bhatt and Ranbir Kapoor at Sonam’s wedding was surely the talk of the tinsel town, but Alia has her own explanation to it saying that she posted way too many single pictures and decided to put one duo. Boy Deepika’s squeal saying, ‘such a liar’ was such a hilar, as Alia would call hilarious. Also, Karan’s Bollywood song references were too cheesy, but that’s Karan being Karan alright! 5. The girls opened up about their hang-out times in Europe for Coldplay’s concert and relished funny moments like peeing in the men’s loo. As Deepika recalled, ‘… both of us were dying to pee. There was a long queue outside the women’s and no queue outside the men’s’, and just like that they shooed away the men and barged in. Also, Deepika eats French-fries, okay bye. 6. ‘Oh my god, did you just burp on the national television?’ Karan jumped on his seat when Alia Bhatt, just being a normal human, burped while talking. Deepika Padukone, who was giving all elderly sister vibes, called out Karan for judging. To the situation’s reference, Alia revealed a funny name that Ranbir calls her, in Deepika’s ears. Well, Karan didn’t get to know what it was and we know why.